Orbit Earth Expo launched in Georgia in 2012. 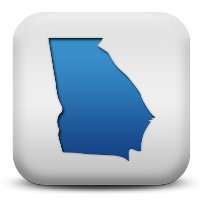 Based in Atlanta, the program delivers content to elementary and middle schools all over the state. Teachers and administrators love the alignment to Georgia Standards of Excellence and the unforgettable reference for students. 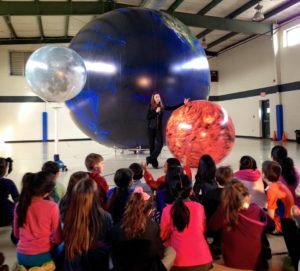 These hard to teach concepts in astronomy are a snap for students when they are recalling information for the Georgia Milestones after experiencing Orbit Earth Expo! Orb, along with his Sun George and his appropriately scaled moon, travel to schools with their teacher friend Ginny Rushing. Ginny began her career as a classroom teacher in 1998, teaching all subjects in elementary schools in both North Carolina and Texas. Originally from Greensboro, NC, Ginny received her degree in psychology and elementary education from Meredith College. In 2012, she began SparkPoint Innovations and moved from the classroom into the world of in-school science programs. She is a certified teacher in NC, TX and GA. Sharing the magic of these STEM programs with tens of thousands of students each year is rewarding and fun!